Intersection (Four Way), Size: 1/2"
Compressed Wooden Pallet are manufactured by compressing wood chips under high pressure and temperature. Compressed Wooden Pallets are durable with a very high density of compressed wood chips, These compressed wooden pallets are Biodegradable and environmental friendly. We have designed this four way wooden pallet keeping in mind the customers demand, hence you can avail these products in various specifications. Its availability in customized form has increased their demand among customers. Our products are tested stringently before they are made available in the market. 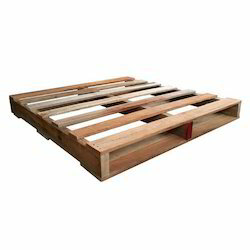 We offer the top range of Four Way Wooden Pallet for our valued patrons. These products are used in numerous purposes in the market. We are manufacturer of Four Way Wooden Pallets.